Introductory note: The examples here are “just examples” and do not necessarily reflect desired match routines or normalization rules for each New Order API integration profiles. The names of the profiles, the names of normalization rules and the match methods used here are only examples. If one institution is integrating with multiple vendors for RTO (Real Time Ordering) then they may wish to use separate integration profiles of type New Order API. For example if the institution has integrated with both vendor OASIS and vendor “E Zafrani” then they may wish to have a separate profile for each vendor. In that way, for example, different normalization processes and match routines can be used per vendor. 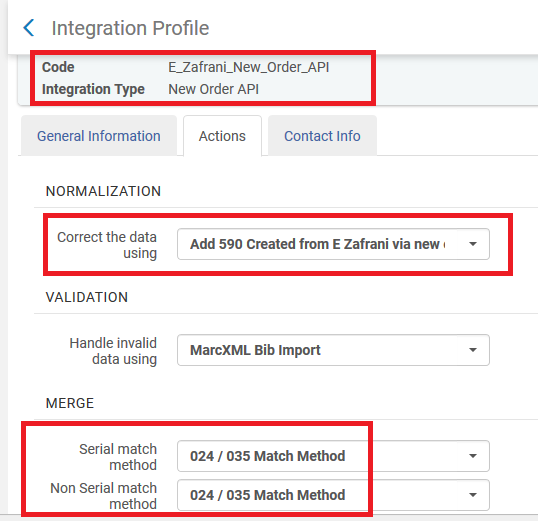 The “E Zafrani Integration Profile” runs normalization process “Add 590 Created from E Zafrani via new order API” and uses match methods based on the 024 and 035 fields. 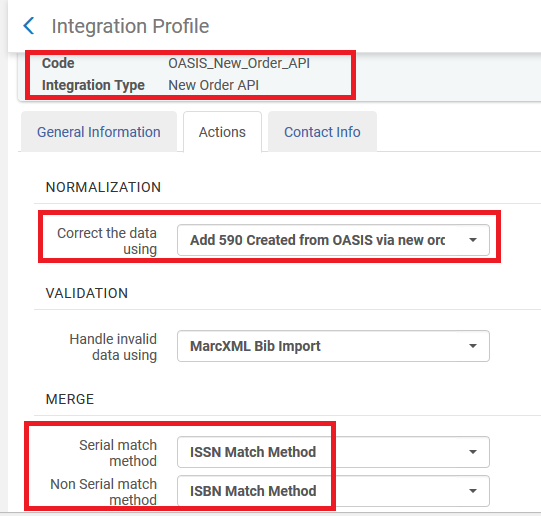 The “OASIS Integration Profile” runs normalization process “Add 590 Created from OASIS via new order API” and uses match methods based on the ISSN and ISBN fields. We see a field added from the normalization process of New Order API integration profile with code E_Zafrani_New_Order_API. Thus we know that this integration profile was used. We see a field added from the normalization process of New Order API integration profile with code OASIS_New_Order_API. Thus we know that this new order API integration profile was used.